We’d love your help. Let us know what’s wrong with this preview of Soriel by Melanie Nilles. Life for Gavin Durinden is about to change from puzzling to downright odd. An intellectual prodigy with blue hair and the ability to create energy from the marks on his palms, he was always told he had a mysterious condition. However, when the scientists at NeoGen Labs begin treatments, everything changes, including the appearance of blue wings. That's not the half of his Life for Gavin Durinden is about to change from puzzling to downright odd. An intellectual prodigy with blue hair and the ability to create energy from the marks on his palms, he was always told he had a mysterious condition. However, when the scientists at NeoGen Labs begin treatments, everything changes, including the appearance of blue wings. To ask other readers questions about Soriel, please sign up. :,) There are no words. Soriel by Melanie Nilles was, with some qualifications, a good read. The characters were engaging, the plot line interesting and original. Gavin, aka Soriel, is a young man with issues and problems, something we can all relate to. He’s handling them as well as he can, which is pretty well considering the fact that he was born with blue hair and, after a “treatment” by his weirdly arrogant doctor, Gavin sprouts wings to match. Then there is Kaira, proof positive that teenagers are the same the universe over: grumpy, angsty and irritable when they aren’t at the high point of the hormone rollercoaster. Not that she doesn’t have reason to gripe. Ripped from her home world for her own protection, longing for her parents and placed with an uncle she cannot wholly respect, Kaira’s attitude is more understandable, perhaps, than that of the average teen. Both these characters grow and change through-out the novel, often in ways that are more interesting and surprising than the average. They are what made Soriel a good read. Unfortunately, the novel was kept from being a great read due to flaws in the writing. Nilles does a lot of telling, rather than showing us through actions and words how the characters feel and why. Worse yet, she tells us the same thing multiple times. Though there is only one plot hole, (has Liriana actually killed people, or no?) and very few grammatical or mechanical errors, I found myself skipping passages which repeated information I’d already been given several times over. Overall, Soriel was enjoyable. I like the characters and wouldn’t mind hearing more about them. There was nothing in the writing that couldn’t be fixed through the help of a critique group or beta readers, which I hope the author will seek in later versions. This is a great story, one that deserves to be told. Nilles has a lot of potential and I look forward to seeing her future work. Melanie Nilles grew up on a western North Dakota cattle ranch and farm and graduated with a degree in business administration from NDSU. She currently resides in central North Dakota with her family, cats, and horse. Her published works include the Starfire Angels series. As M.A. Nilles, she publishes darker adult fiction, including the fantasy Tiger Born, the first in her Demon Ages series. Gavin Durinden has problems. Not quite the usual sort that teens have to put up with - he has blue hair and an unidentified 'condition' for which he has to be treated at NeoGen labs by a cold and arrogant doctor who seems to like ordering Gavin's mum around. Quickly moving forward with the plot, Gavin discovers he is really Soriel, an alien kept as a lab rat. Others of his race - winged angel-like beings - become involved, including the angsty teen alien Kaira for whom Gavin/Soriel starts to have Gavin Durinden has problems. Not quite the usual sort that teens have to put up with - he has blue hair and an unidentified 'condition' for which he has to be treated at NeoGen labs by a cold and arrogant doctor who seems to like ordering Gavin's mum around. Quickly moving forward with the plot, Gavin discovers he is really Soriel, an alien kept as a lab rat. Others of his race - winged angel-like beings - become involved, including the angsty teen alien Kaira for whom Gavin/Soriel starts to have typical teen feelings, and a huge plot to alter his (and others like him) DNA is revealed, putting his whole species at risk, and making for an intriguing story. It's fast, fun, and full of really individual characters and intrigue that keeps twisting and turning apace. For me it missed the fifth star on ending. Having made the driving force/ticking clock imperative the need to cure/save Soriel before he succumbs totally to the StarFire, when it didn't happen I felt cheated. The ending has its merits, but it felt like a bit of a copout. This review has been hidden because it contains spoilers. To view it, click here. I won this in a First Reads Giveaway and this was the first book I have ever read by Melanie Nilles. After finishing the book, I am not exactly sure how I feel about it. Don't get me wrong, I enjoyed reading the book but I was lost from terms like Inari, Shirukan, and Keeper just being thrown around from the start of tbe book as I have not read any of the previous books in the Starfire Angels series. And I was grateful that such terms were explained about a third of the way through the book so I I won this in a First Reads Giveaway and this was the first book I have ever read by Melanie Nilles. Don't get me wrong, I enjoyed reading the book but I was lost from terms like Inari, Shirukan, and Keeper just being thrown around from the start of tbe book as I have not read any of the previous books in the Starfire Angels series. And I was grateful that such terms were explained about a third of the way through the book so I was no longer as lost as I was. So I don't recommend that anyone else attempt to read this book without first trying to jump into the previous books or else wind up very confused like me. Otherwise, I enjoyed the characters, in particular Lirianda's struggle with herself between being a Shirukan and her maternal side that cares deeply for Soriel despite only being a foster mother as well as Kaira's feisty personality. Soriel was such an amazing roller coaster ride that I never wanted to end. The book starts out with a young man named Gavin who's trying to figure out whats wrong with him and why he has the ability to do certain things and why he has these strange blue markings on his hands. Long story short he sends a blood sample to get checked out which in turn gets sent to his moms work which turned out to be a big no no and sets him on a course to discover his true self and a brief encounter that leads him Soriel was such an amazing roller coaster ride that I never wanted to end. The book starts out with a young man named Gavin who's trying to figure out whats wrong with him and why he has the ability to do certain things and why he has these strange blue markings on his hands. Long story short he sends a blood sample to get checked out which in turn gets sent to his moms work which turned out to be a big no no and sets him on a course to discover his true self and a brief encounter that leads him to falling in love. 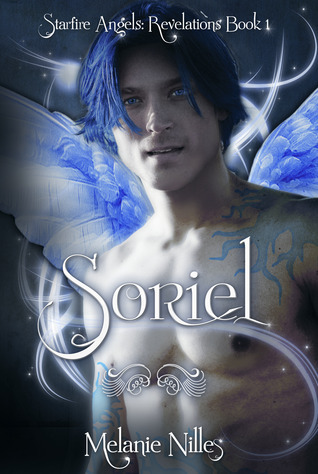 Soriel is a very quick read I could not put it down until it was finished. This sci-fi based series has been captivating to me. This book in particular had many twists and turns that kept me interested in Gavin/Soriel’s story. This book is like an action adventure movie combined with Romeo and Juliet. I can’t wait for the next book to come out. I was very excited to win this book through GoodReads. I have never read anything by this author but Starfire Angels has been on my To-Read list for a while now. This was a very quick read not only because it is a short book but also because I couldn’t put it down. I look forward to reading the rest of this series. Totally worth the wait! I literally couldn't come unglued from this new installment of the SFA series. The author truly knows how to capture the readers attention immediately & keep it gripped until the last turn of the page. This fresh look at the story really had me hooked & I kept flipping the last page back & forth because I didn't want it to be over! Fantastically done! Just as I was hoping this is a wonderful continuance of the Starfire series! I couldn't put it down and it left me excited about reading the next book in the series. I laughed, I cried, and I screamed at the book like I was right there and the characters could hear me...LOL! I would highly recommend reading the entire series. Melanie has a very distinct & unique way of bringing her characters to life. Soriel drew me in and left me wanting more. I swear I had just started reading it & found myself on the last page before I knew what happened. Melanie Nilles (aka M. A. Nilles) is an avid animal lover and resides with her husband, kids, and a clowder of cats who take advantage of their human slaves for food and warm laps. An equestrian of over thirty years, Melanie has trained and ridden all disciplines from race horses to cow horses and western show and speed events to jumping and dressage. At the same time, Melanie (Mel to those who kno Melanie Nilles (aka M. A. Nilles) is an avid animal lover and resides with her husband, kids, and a clowder of cats who take advantage of their human slaves for food and warm laps. An equestrian of over thirty years, Melanie has trained and ridden all disciplines from race horses to cow horses and western show and speed events to jumping and dressage. At the same time, Melanie (Mel to those who know her) has always had a fascination with science fiction and fantasy, and in 2015, she became an Active Member of SFWA. Her published works include the Starfire Angels series, Adronis series, The Luriel Cycle trilogy, and others. As M. A. Nilles, she writes darker fiction, including the Legend of the White Dragon epic, Tiger Born, and Spirit Blade. For updates, visit her website at www.melanienilles.com or her blog at http://manilles.blogspot.com/ .